Clarion Call - Where are the Judges? 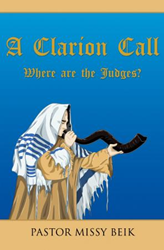 Pastor Missy Beik’s new book, Clarion Call - Where Are The Judges?, ($12.99, paperback, 9781498469166; $6.99, e-book, 9781498476799) will encourage Christians to step out into the Kingdom of God and release what God has given them: the Word, the strategy, to use the weapon of praise, prayer, or dance. According to the author, God desires each Christian to be in position and to reach out to a hurting world, desperate for the supernatural gifts of God. She reminds readers that Jesus died on the cross so each person could be filled with anything needed. This is not about education, money, or influence. This is about being the judge – ability to discern according to God’s standards – that God is calling His children to transform the world for His glory. The author believes that people do have the answer for that hurting neighbor, coworker, or friend. It can all be found through Jesus Christ, and what He died to give every Christian. The stories in the book show the failure when people don't listen to God, and see the peace and success when people line up with God's ways. This inspiring book will bring hope and purpose to many in the Kingdom of God. Pastor Missy Beik established Handmaidens In His Service in 2001, a prayer and Bible teaching ministry. In 2006, she established Eagle’s Nest International Church. In every service, the people who come receive the Word of God, communion, prayer for physical, mental, and emotional healing, and worship. Pastor Missy has 71 CD sets that focus on teaching the Gifts of the Holy Spirit, Effective Prayer, Your Authority in Christ, and Leadership training. All are Biblically based rich teachings for spiritual growth. In 2001 she wrote Jump Into the Kingdom, and then Flourish In Your Christian Walk with the Gifts of the Holy Spirit in 2005. Pastor Missy and her husband Steve have been married 45 years and have 4 adult children and 2 grandchildren. For more information about the author or her book, please visit http://www.pastormissy.org. Xulon Press, a division of Salem Media Group, is the world’s largest Christian self-publisher, with more than 15,000 titles published to date. Retailers may order Clarion Call - Where Are The Judges? through Ingram Book Company and/or Spring Arbor Book Distributors. The book is available online through xulonpress.com/bookstore, amazon.com, and barnesandnoble.com.